Magnetic Levitation, popularly known as ‘Maglev’ is the latest mode of transport and one that is expected to revolutionize the transportation world in the 21st century. Based on the principle of electromagnetic propulsion, the Maglev train uses advanced technology wherein the vehicle is guided on a custom made guideway. The vehicle is a lot faster as compared to wheeled vehicles and floats over the guideway on a magnetic field, propelled forward by the changing magnetic fields along the guideway. Maglevs have excellent acceleration and can reach speeds of up to 300-500 miles per hour or more. Maglev trains do not have the usual set of wheels nor do they have the kind of mechanical engines that conventional types of trains and vehicles have. Thus, one of the main advantages of the Maglev is that it requires little maintenance. As these trains float, the amount of friction between the vehicle and the tracks is minimal. The amount of noise pollution created too is considerably less. Maglevs are considered more energy efficient, as they do not use fossil fuels such as diesel and petrol that are used by trucks, airplanes, and cars. Using these trains as an alternative means of transportation is a possibility that is being seriously explored around the world. The major advantage of Maglevs is their speed and the ability to transport thousands of passengers and goods everyday at much lower costs and in shorter spans of time. Maglevs have a long lifespan too, compared to the current vehicles like trucks and airplanes. Although they run on electricity, the resulting carbon emission is low. In addition, the safety factor of a Maglev is very high since the possibility of a collision is minimal. Maglev trains do have their disadvantages, as presently they are not commercially viable and they lack in infrastructural facilities. 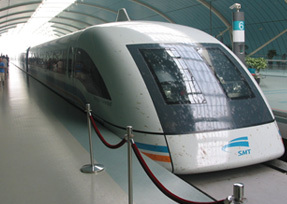 The first country to introduce a Maglev service was Britain in the 1980’s. Maglevs are also being considered as a transport option to travel in space.